A few unexpected ingredients like peanut butter, vanilla protein, and a coconut-cocoa butter glaze take these bars to a whole new level. This is what protein treats should taste like! 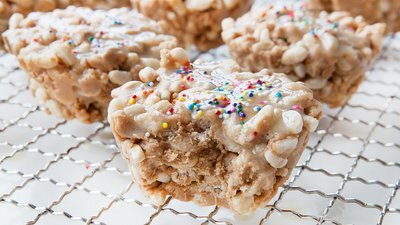 Remember those ooey, gooey rice cereal bars your grandmother made? No need for them to live only in your memory, or as a sneaky bite at your kiddo's birthday party. It's time to bring them back out into the open—healthy style. You may actually like this updated take better than the original! I used gluten-free, paleo-friendly ingredients, plus Nourish + Bloom's Vanilla Spice Whole Food Shake to make a delectable treat. So, if you're not in the mood for a shake, or your sweet tooth is acting up again, try this recipe! For more yummy paleo treats like this, check out Amazingpaleo.com. Our vision is to revolutionize women’s health by developing products with the highest-quality ingredients from the best possible sources.